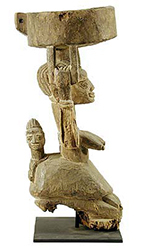 The Yoruba offering bowls above have been vetted as authentic, with evidence of age and use. The bowls below show no real indication of tribal use and were probably made for the art market. 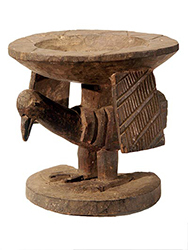 These bowls are used to hold kola nuts as offerings of hospitality or as receptacles for the sixteen sacred palm nuts used in divination. 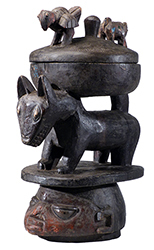 This form, with the bowl on top, is known as an Agere Ifa. 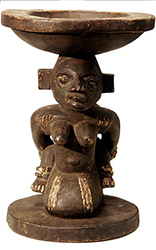 Another form, with a kneeling female figure with lidded bowl, is known as an Opon Igede Ifa can be seen on Offering Bowls Page 2. Bowls 24, 38 and 39 do not fit either category.